Kingpin Hemp Wraps are the latest and greatest of the many natural, pure hemp wraps to hit the industry. They are available in an array of delicious flavors and feature Perfect Fold Technology, as well as burn extra slow! Made from natural toasted hemp, these wraps contain NO TOBACCO. | 4 Wraps Per Pack | Includes 12 Packs of KingPin Goomba Grape Pure Hemp Wraps and an ES Scoop Card! 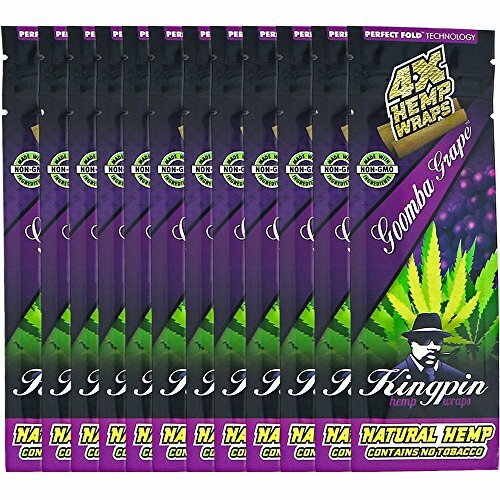 Includes 12 Packs of KingPin Goomba Grape Pure Hemp Wraps and an ES Scoop Card! Contains 4 Hemp Wraps/Pack. Made From Natural Hemp, NO TOBACCO! Perfect Fold Technology makes for Fast and Easy Rolling! Extra Slow Burn means your session lasts extra long! If you have any questions about this product by Kingpin, contact us by completing and submitting the form below. If you are looking for a specif part number, please include it with your message.